Who says the Republicans don’t engage with the arts? Yesterday, Missouri Republican Party Vice-Chairman Valinda Freed was caught out leaning on a Thomas Hart Benton mural, jotting her number on a business card for an unidentified gentleman friend. 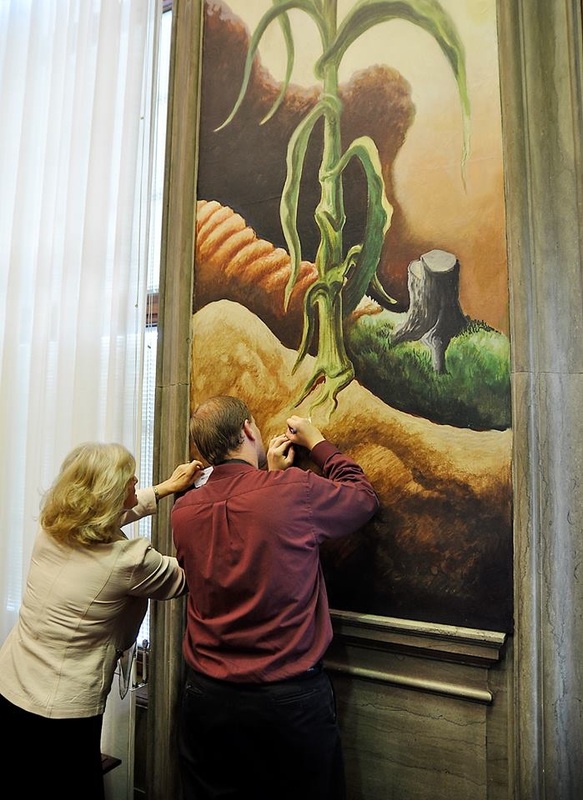 Missouri Republican Valinda Freed leaning on a Thomas Hart Benton mural to exchange her phone number with an unidentified man. Photo Dave Marner. Freed, who according to her LinkedIn page is also a member for the activist group Concerned Women for America, appears very concerned indeed today, though perhaps for her dignity rather than her country. ‘I offer my sincere apology for my completely unplanned and thoughtless act’, she told the local press after the image went viral. All we can hope is that Freed hasn’t made her mark on the Social History of the State of Missouri (as the Benton mural in question is titled). In any case, Rakewell politely suggests that next time, Freed might like to use a desk. Or better still, Tinder.